According to Netflix, AirPlay is no longer supported on iPhone, iPad, or iPod touch due to "technical limitations." There are no details from Netflix on what those technical limitations might be. It's not clear why AirPlay support has been removed from the Netflix app. The feature has been available since 2013 and it was working up until this week. Netflix apps are available on the Apple TV, consoles, smart TVs, iOS devices, and more, so there's not a real need to use AirPlay to watch Netflix content, but there were instances where it was convenient to use. Netflix has in recent months been making efforts to better protect its content. 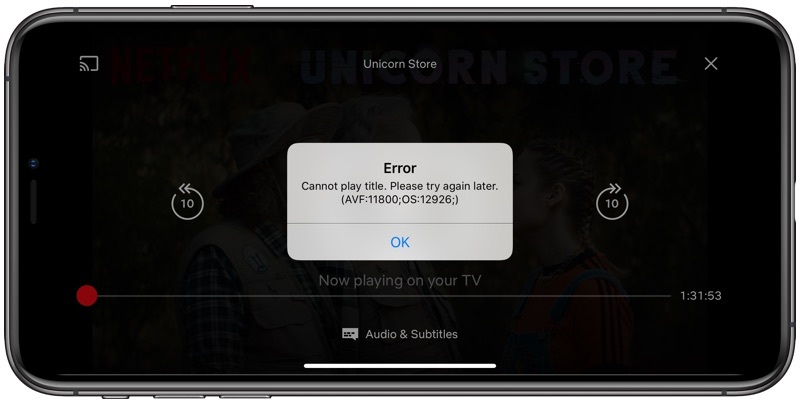 In December, Netflix stopped allowing customers to sign up for Netflix within the iOS app, and Netflix has never opted to participate in Apple's TV app, making it unavailable in the "Up Next" feature of Watch Now. Netflix CEO Reed Hastings recently confirmed that Netflix had no plans to be a part of Apple's TV plans and said that Netflix isn't interested in offering its content in alternate ways. "We want to have people watch our shows on our services," he said. It's like they want me to cancel my subscription. Netflix has just released a "mobile only" tier in some countries for a discounted price. I think this is one of the preventative measures for it. Not sure why one would need this anyway.. if you have an apple tv to airplay to, you might as well use the netflix app on it. If you have a tv with integrated airplay, it is new and definitely has netflix on it. Netflix has it out for apple. It's irritating. The beginning of the end. Sad. Why would anyone use Airplay to watch Netflix? Not being snarky. Honestly curious. Seems weird. Because sometimes we don’t own the tv we are airplaying to, don’t want to log into it, etc. Like in an office, a hotel, etc. I only have Netflix for Better Call Saul and Brooklyn 99. They’ve gotten rid of so many movies, and now that they’re acting in such a petty way to smite Apple but also customers, I’m not sure how much longer I’ll remain one. These anti consumer practices need to stop. Cancelling my subscription to protest this garbage move.